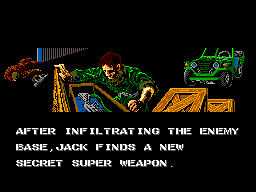 Just as you stole the enemy's secret weapon and started back, the enemy spotted you! Now you must fight your way back to safety. But be careful! 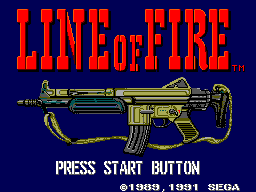 You're in the line of fire. 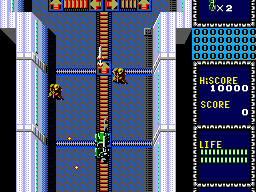 Using controller 2 throughout, hold Buttons 1+2 as the title screen appears (the screen with the gun), then press any button to access and use a sound test. You will also be able to select your starting level. During the game, press Up to increase your lives and Button 1 to decrease them. Pressing Down completes the level. Hold Buttons 1+2 while powering on the system.